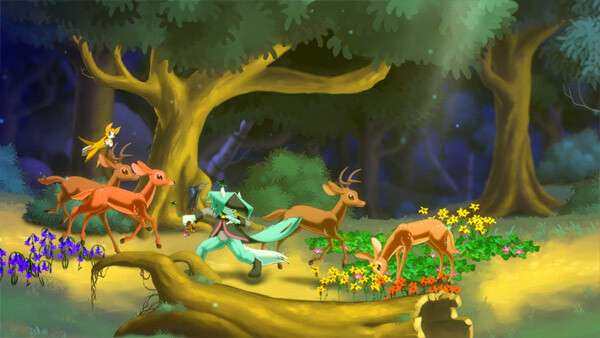 Dust: An Elysian Tail offers plenty of content and varied mechanics for a downloadable title, and is solid in just about every aspect. Certain elements could have been handled better, but they aren't enough to drag down what is predominantly a very enjoyable experience. This year, Microsoft’s annual Summer of Arcade promotion is closing with Dust: An Elysian Tail, and this is definitely a case of saving the best for last. The game offers plenty of content and varied mechanics for a downloadable title, and is solid in just about every aspect. Certain elements could have been handled better, but they aren’t enough to drag down what is predominantly a very enjoyable experience. 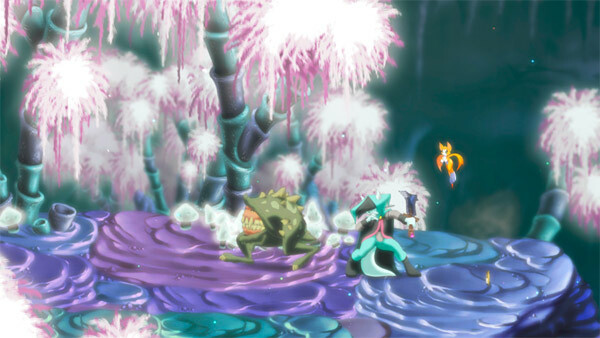 The game takes place in a fantasy realm with numerous talking animals and not a human in sight. It opens with the title character, Dust, waking in a forest with no memory of who he is or where he came from. Immediately after he gains consciousness, a mystical, sentient sword named Ahrah appears and grants Dust ownership of itself for yet-to-be-revealed reasons. A small, batlike creature named Fidget also shows up demanding the sword, and decides to tag along with Dust until he remembers his purpose. From there, Dust will visit various villages and traverse numerous landscapes, and it all looks wonderful. The hand-drawn and painted characters and backgrounds are a sight to behold in HD, and the animation on Dust and Fidget is smooth and lively. 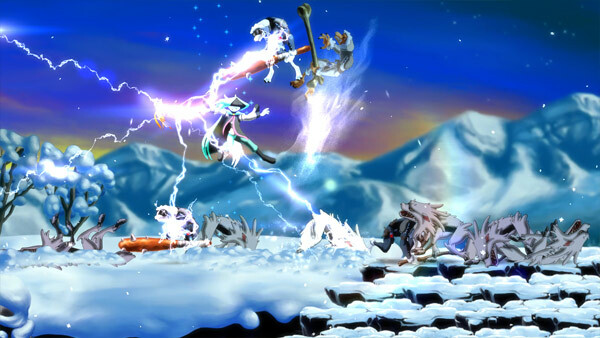 Amazingly, the visual aspect of the game was created by a single artist over the span of several years, and his dedication to the project certainly shows in the excellent visuals. It also helps that the game has a real sense of personality and character to its cast. Dust may fall into the cliched trope of the brooding amnesiac protagonist, but he is still able to show some personality and a sense of humor. Fidget can be annoying at certain points, but genuinely funny at others (“He should have saved first,” she sighs as an enemy drone dies via its own carelessness). The characters you’ll come across in the villages are also not solely there as bland quest givers. Each one has at least one notable personality trait that comes through via some very well-done voice acting. There is a lot of spoken dialogue crammed into this downloadable title, and the developer should be commended for both putting in so much and doing such a good job with it. Structurally, the game is similar to side-scrolling classics like the 2D Metroid games and Castlevania: Symphony of the Night, in how you can progress and explore. You have a world map from which you can enter and exit individual levels, more of which become available as you progress through the story. While there are certain levels you must visit at some point to continue the game’s main plot, a lot of it is free for you to explore in your own order. The catch is that certain areas will be unavailable to you, blocked by tunnels that you can’t slide through or vines you can’t climb. These additional abilities are obtained through glowing orbs found throughout the main story. This encourages you to go back to previous levels and explore them again to find hidden treasures and items. The game, despite being a side-scroller, takes a cue from such expansive open-world games as Skyrim in that it has a quest system with plenty to offer. Most of the characters in the village will offer their own individual quests when you talk to them, which vary from finding items to defeating monsters. While you can choose to focus on the main story and not get distracted, there are so many quests to do that you may find yourself accomplishing a few simply by going through environments on your main journey. They’re generally fun to do, and offer rewards in the form of special items, Xbox achievements, and perhaps most importantly, experience points. Dust has a surprisingly deep leveling and stat-based system, both of which accentuate its frequent combat scenarios. Killing monsters nets you experience points, and when you gain a level, you can choose to strengthen such aspects as strength and defense. This mechanic is nice in how it offers multiple options for players who want to focus on getting Dust as strong as possible right away, as well as those who want his stats to be more well-rounded. Additionally, much like a traditional role-playing game, you can pick-up money and items dropped by slain monsters, which can then be taken to discovered vendors. These items include food to regain lost health, armor to boost your defense, and augment items to strengthen your sword in various categories. Other than the aforementioned food, players won’t come across a large assortment of items, but there’s definitely enough of it to spend your frequently-earned cash on. The real-time battle system found in Dust is well thought out, but t also happens to be one of the game’s drawbacks. Dust can pull off various combos with his sword via the X button, perform a windy spin attack with the Y button, or have Fidget throw various types of projectiles by pressing B. He can then spread these across the screen via the spin attack. The game has a combo meter built in to see how many hits you can land on a group of enemies within a certain amount of time, and rewards high combos with extra experience points. This is a nice way to get players more interested in perfecting their battle techniques, but it’s hard to deny that, with the amount of fighting you do, it gets a bit tiresome. The game is smart enough to award you additional attacks as you progress, but those can only feel fresh for so long. Thankfully, save points are very frequent, so you can always take a break if you’ve been fighting for a while. I greatly enjoyed Dust: An Elysian Tail. Despite its noted combat issue, it has an undeniable charm in its presentation, a well thought out storyline, responsive controls and a huge amount of content for a downloadable indie game. For those who don’t play many sidescrollers, it may serve as an excellent reminder of what the genre can offer. Conversely, for fans of the genre, it’s a no-brainer of a purchase.